Join the discussion on our forums! Come discuss Giant Mastodon over in our dedicated Giant Mastodon discussion topic. Is nobody else freaked the hell out by this thing's face? Like, I just got this in gold, and it looks like it wants to trample my soul and my family and then eat the remains, then run for president. 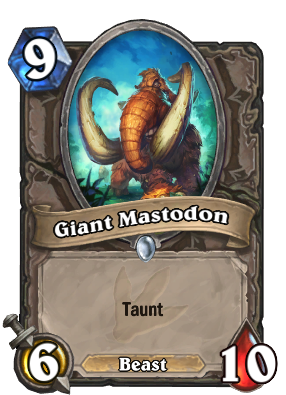 Ok, so we have this as Manny, Sabretooth Stalker will be Diego... now we only miss a sloth to play Sid and we're all set for Ice Age: Hearthstone! There is this card called Eldritch Horror, abd its not even good in arena, so this one is just trash. Might still find its way into Curator decks for a big beast to pull, especially in Wild Astral Communion decks. So, it's not as good as a card such as Bog Creeper. However, I see this as a near Arena All-Star. I actually think this card is alright because 6/10 dodges bgh, you can buff and adapt this card in control hunter and it is a great wall with the new priest spell that summons minions that cost 8 or more. Do you really think that people will return to 5 mana 4/2 removal? Not quite Bog Creeper in Arena, but probably close. It's an injection of a ton of beasts like this that makes me sad Ram Wrangler is leaving standard. only thing is a Mastodon isn't a mammoth .. i was legit looking for a legend mammoth ..
Shh, he's still salty about that!